The movie itself is somewhat complicated. It's fundamentally a story about imaginary friends and the value they can have for children. But it's also the sequel to a 1942 movie about a were-panther fighting against her past and ultimately losing her life. 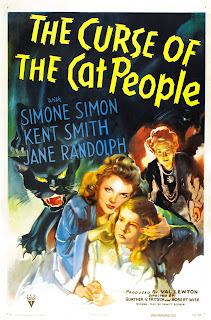 Incidentally, the first film, Cat People, was included on the DVD we got from Netflix. It's considered extremely influential in horror, and it holds up well. There are a handful of awkward moments you'd expect from a movie made in the 40's, but it's absolutely worth watching if you're a fan of the genre. 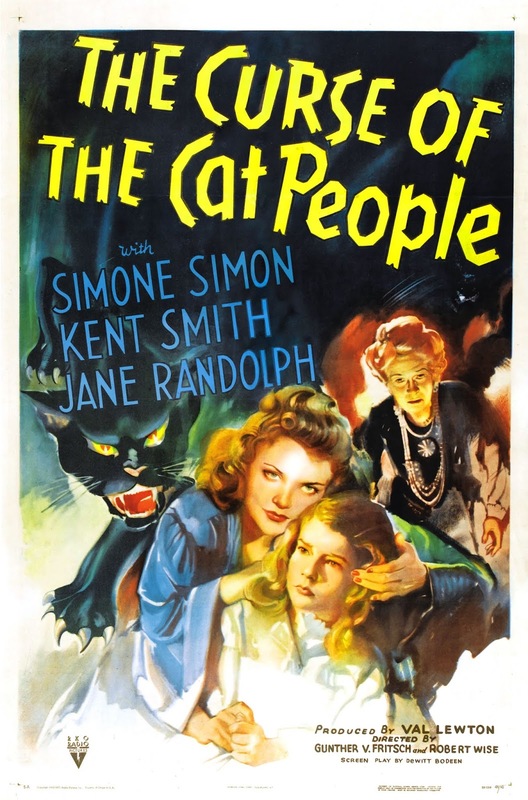 Curse of the Cat People is sort of a forced sequel. It's pretty obvious the original story (and likely the original script) was entirely made up of new characters, and at some point in its development it was re-configured as a sequel. Now, the widower who'd been married to the aforementioned were-panther has married another character from the first movie, they've moved out of the city, and they have a troubled daughter. Oliver and Alice, the parents, have either deluded themselves into believing there was a rational explanation for the first movie, or the filmmakers retconned the last thirty minutes of Cat People. They're fairly adamant that Irena was insane, despite the fact Cat People was pretty clear that she was actually turning into a panther (to be fair, enough of this was from her perspective that there was some wiggle room). At any rate, this is significant because Oliver has developed a phobia of over-active imaginations. He blames this for the death of his first wife, and he reacts extremely poorly when he sees similar behavior in his daughter. His daughter, Amy, is the movie's main character. She doesn't play well with other kids, largely due to her aforementioned imagination. However, she does befriend an old woman living in a rundown house with her grown daughter. The old woman seems to be suffering from dementia - she's convinced her daughter died when she was eight, and the woman claiming her identity is a fraud. This becomes a major plot point later, which makes it unfortunate it doesn't get any development or explanation. At any rate, the old woman gives Amy a ring, which Amy's butler says looks like a ring of wishes. After seeing a picture of Irena, Amy uses it to summon her into being. Or... she imagines her. It's not clear whether any of this is real, though a song from the first movie implies this is actually Irena's ghost. Regardless, they become friends and hang out for months in secret. Skip ahead to Christmas. After some caroling and gift exchanges (Amy gives Irena a pin), Oliver discovers his daughter's not only been spending time with an imaginary friend, but it's an imaginary friend she imagines as his first wife. He freaks out and spanks her, then Irena appears to Amy, telling the girl that she's leaving (this isn't entirely explained, but the implication is the ghost's presence was only permitted so long as no one knew). Amy sneaks outside and goes looking for Irena during a blizzard. Meanwhile, cut to the old woman's house. She's cherishing a ring Amy bought her while her daughter freaks out about the fact her mother cares more about Amy than her. She tells her mother she'll kill Amy if she ever returns. So... yeah. This relationship probably could have used more development. Naturally, Amy makes her way to the house and meets up with the terrified old woman, who has a heart attack trying to hide the girl. The woman's daughter comes across the scene and is clearly ready to make good on her vow. But as she's menacingly approaching, Amy sees an apparition of Irena appear superimposed over the murderous woman. Amy runs to her and hugs her, which freaks the woman out and causes her to take pity on the child. Oliver shows up, takes Amy home, and promises to believe her when she tells him about things she sees. He even claims to see Irena in their yard, though he doesn't actually look. There are a few points lost in the synopsis. First, like its predecessor, there's some great imagery in this movie. The shots of Irena's ghost (or whatever she is) are beautiful, particularly when she shows up in a white cape for Christmas. Think iconic Christmas angel, and you'll have a pretty good idea. The sequences of Amy running through the blizzard are also fantastic - they captured the alienation of the scene perfectly. Same goes for the interiors of the rundown mansion where the old woman lives. This film is well designed and well shot. Glancing at Wikipedia, it seems like this didn't perform anywhere near as well as its predecessor, which isn't entirely surprising. The first movie was horror, while this was really more of a fantasy. It's more interested in building a sense of unreality than it is in scaring the viewer - at its core, this is a fairy tale marketed as a horror. Along with the absence of any "cat people," it goes a long way towards explaining why audiences were disappointed. As a fairy tale, though, it's pretty good. I can't quite call it great, because it's hamstrung by pretending to be a sequel. The details they imported hold it back from embracing its own story - in trying to tie it to Cat People, the filmmakers sabotaged what was almost a fantastic blend of a ghost story and a psychological drama about imagination. Fortunately, they didn't sabotage it enough to stop it from being interesting. It's a cool film with some great moments. Let's get back to Christmas. I said at the start this is only borderline a holiday movie, but I'm going to walk that back a bit. Granted, you could shift the action to another time of year and still have it make sense, but you'd lose the sort of the otherworldly aspect of the holidays. This makes use of the magic of Christmas, not in a cheesy Hallmark way, but as a vaguely unnerving, surrealist dream. It's not unusual to see these tones played with, but it's rare to see them used this sincerely. It's not the best Christmas fantasy out there, but if you're in the mood for something old and you're getting tired of It's A Wonderful Life, you could do a lot worse.